568 pages | 162 Color Illus. Is it possible to learn something without being aware of it? How does emotion influence the way we think? How can we improve our memory? Fundamentals of Cognition, third edition, provides a basic, reader-friendly introduction to the key cognitive processes we use to interact successfully with the world around us. Our abilities in attention, perception, learning, memory, language, problem solving, thinking, and reasoning are all vitally important in enabling us to cope with everyday life. Understanding these processes through the study of cognitive psychology is essential for understanding human behaviour. a supporting companion website containing multiple choice questions, flashcards, sample essay answers, instructor resources, and more. The book provides a perfect balance between traditional approaches to cognition and cutting-edge cognitive neuroscience and cognitive neuropsychology. Covering all the key topics within cognition, this comprehensive overview is essential reading for all students of cognitive psychology and related areas such as clinical psychology. "Eysenck and Brysbaert have produced the ideal introduction to cognitive psychology. It combines breadth of coverage with a depth of scholarship that allows the text to be readily accessible without being overly simplistic, draws on the best examples of contemporary research while incorporating important historical perspectives, and engages the reader with established findings and scientific challenges alike." "A splendid introduction to cognitive psychology that emphasises the applications of the subject, and how people actually manage to live and operate in the world. The level of detail is just right. It is written in a lively and engaging manner, and will quickly take a reader who knows nothing of the area to a level of considerable expertise." "As stated by the title, this book is a fundamental for any psychology student. Despite the big challenge of presenting what we know about human cognition, Eysenck and Brysbaert manage to cover all domains of cognitive psychology, while providing clear learning objectives, definitions of the most important concepts, and helpful examples or activities to support step-by-step students in their discovery of this exciting field of psychology." 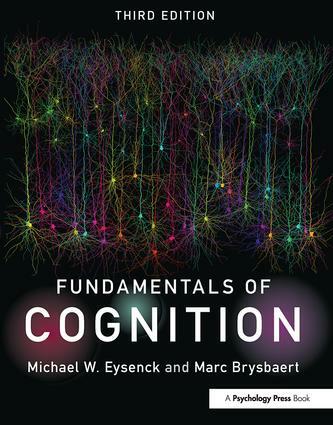 "Fundamentals of Cognition by Eysenck and Brysbaert is a great introductory textbook on cognition. At the beginning of each chapter the learning objectives are given and throughout the book important key terms are listed. One aspect that makes this book really compelling is that in each chapter there is a section called "in the real world" where the students can learn how findings from cognition research are used in everyday life. This makes this book unique, and unlike all others." Preface. 1. What is cognitive psychology? 2. Visual perception 3. Attention and performance 4 .Short-term and working memory 5. Learning and long-term memory 6. Knowledge in semantic memory 7. Everyday memory 8. Language 9. Problem solving 10. Judgment, decision making, and reasoning 11. Cognition and emotion. Glossary. References. Name index. Subject index. Michael W. Eysenck is Professor Emeritus in Psychology at Royal Holloway, University of London, and is also a Professorial Fellow at Roehampton University, UK. He is the best-selling author of a range of textbooks, including Cognitive Psychology: A Student’s Handbook, Memory (with Alan Baddeley and Michael Anderson), and Fundamentals of Psychology. Marc Brysbaert is Professor of Psychology at Gent University, Belgium. He has authored a number of textbooks and is Editor of the Quarterly Journal of Experimental Psychology.